YAMAHA Tabletop Glockenspiel 32 Sound with a mallet TG-60 New from Japan. Brand New in Original Box. 32 sounds (F to C) aluminum sound board (with derived sound) With mallet Width · depth · height 65 × 35 × 6 (cm). We are sellers of Japan. To satisfy our customers, we will do our best. International Buyers - Please Note. These charges are the buyers responsibility. We do not mark merchandise values below value or mark items as gifts - US and International government regulations prohibit such behavior. 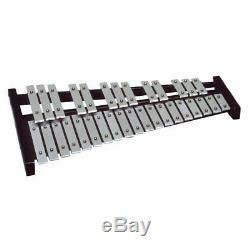 The item "YAMAHA Tabletop Glockenspiel 32 Sound with a mallet TG-60 New from Japan F/S" is in sale since Wednesday, December 13, 2017. This item is in the category "Musical Instruments & Gear\Percussion\Drums\Other Drums". The seller is "skmt01" and is located in Fujisawa. This item can be shipped worldwide.